Leading women footballers have abandoned their legal action over the use of artificial pitches at this year's Women's World Cup in Canada. A case claiming sexism against the Canadian Soccer Association (CSA) and world governing body Fifa was withdrawn at the Ontario Human Rights Tribunal. Eighty-four players from 13 countries were involved in the lawsuit. Players' attorney Hampton Dellinger said the case had "highlighted continuing gender inequity in sports". He claimed that the action, although abandoned, had "lessened the chance that such wrongdoing will occur in the future". Players argued that the women's tournament should be played on similar surfaces to the men, and that synthetic pitches would increase the danger of injuries. But Fifa said it would not make a switch and that Canada was the best choice to host the tournament, which will be held from 6 June to 5 July. 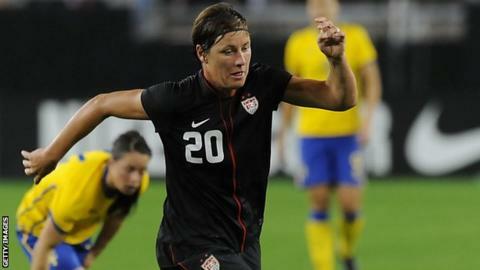 United States striker Abby Wambach, 34, one of the players involved, believes that the challenge will have a positive impact on women's sport. She said: "I am hopeful that the players' willingness to contest the unequal playing fields - and the tremendous public support we received during the effort - marks the start of even greater activism to ensure fair treatment when it comes to women's sports." Players from Australia, Brazil, Costa Rica, France, Japan, Mexico, New Zealand, South Korea and Spain were among those involved in the legal action. Dellinger said that the players were "putting the sport of soccer first" by abandoning their legal fight. "The players' united, international effort to protest discrimination has had a positive impact," he added. "The deplorable artificial surface at BC Place, the site of the final, will be replaced. Goalline technology will be used for the first time in a women's World Cup and we know that the 2019 World Cup will be held on grass." Fifa Secretary General Jerome Valcke said his organisation shared the players "desire and enthusiasm" for the "best possible conditions to perform well". He said: "We - the participating teams and the organisers - can now all focus on the preparation and promotion of the biggest event in women's football this June in Canada." Canada Soccer's president Victor Montagliani said he was "pleased to be moving beyond this discussion". England have qualified for the tournament, but no English player signed the petition.